Take in the friendly atmosphere at RMAF where all are welcome and questions are encouraged. You will experience in one location all the major household audio brands from Sony to McIntosh to Martin Logan. Have your eyes but mostly your EARS opened to a host of established, superior-quality “audiophile” companies such as Wilson, Cardas and Jeff Rowland Design Group, Inc. that you won’t find in most retail stores. RMAF provides a lively atmosphere of interactive experiences that ranges from engaging with industry engineers, owners and salespeople to live entertainment and formal seminars on a variety of current topics and trends in the audio industry. Many companies present their world-wide debut of new products and additionally offer discounted “show-prices” on selected equipment. Both of which are listed here. When you arrive in Denver, go to the Denver Tech Center Marriott and get oriented by visiting the Colorado Audio Society at the registration desk. Volunteers will explain and give guided tours of the event’s complexes and lively layout – including the several floors of demo rooms and displays. Seminars are being finalized, covering a variety of topics relating to the audio hobby. Live entertainment nightly. Check the website for all current information. 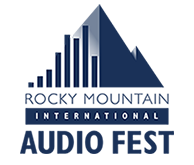 Great listening experiences…see you at RMAF!